In the United States, two types of cinnamon are sold in specialty markets and spice shops, though you will likely only find one type in a typical grocery store. These two cinnamons are not alike. One is not true cinnamon at all, but the bark of the trunk and branches of a species of tree related to true cinnamon. True cinnamon is also known as sweet cinnamon or Ceylon cinnamon. It is grown in Sri Lanka, Bangladesh, southern India, Sumatra and Java. Sticks of Ceylon cinnamon feel thin and flaky due to the many layers of the sticks. Only the bark of young shoots of the ceylon cinnamon plant are harvested. Ceylon cinnamon possess a subtle but deep, sweet flavor. 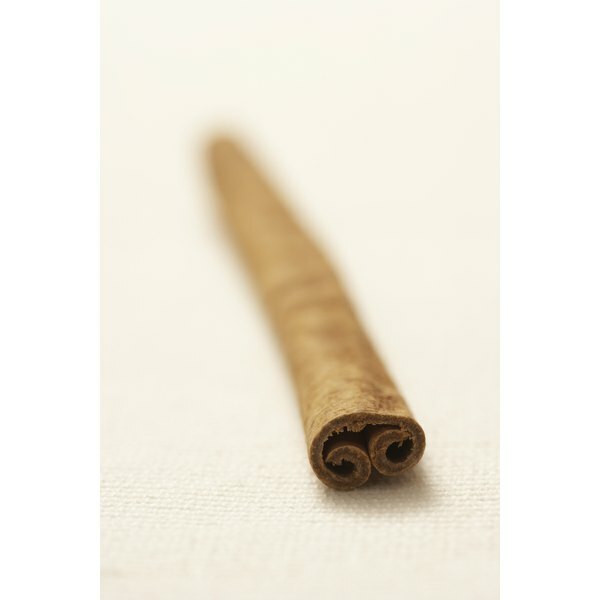 When purchasing cinnamon, look for a light brown stick that is delicate and not hollow. Ceylon cinnamon is often referred to by its scientific names Cinnamomum zeylanicum and Cinnamomum verum. Most of the spice sold as cinnamon, both in its whole form and ground, is actually cassia. This spice is also called Chinese cinnamon or Burma cinnamon and is cultivated in China, India and Vietnam. Cassia comes from the bark of the branches and trunk of several species, including Cinnamomum aromaticum, Cinnamomum loureiroi and Cinnamomum burmannii. This cinnamon substitute, in stick form, is dark brown, hard and hollow. The flavor is harsher and stronger than true cinnamon. Burma cinnamon has the smallest amount of essential oil of all cassia species. The fragrant chemical coumarin is found in a number of plants, including cassia, or Burma cinnamon. In production, coumarin has been used as a scent in perfumes and colognes, an enhancement in tobacco and as an appetite suppressant. It can be transformed into an anti-coagulant when combined with certain fungi and is used in some blood-thinning medications. According to the European Food Safety Authority, ingesting cassia, a relatively major source of coumarin, in large amounts can cause damage to the liver. The recommended tolerable daily intake of coumarin is 0.1 mg per kilogram of body weight; 1 tsp. of cassia powder contains between 6 to 12 mg coumarin. Medical research into possible effects of cinnamon have generally focused on cassia, or Burma cinnamon, rather than Ceylon cinnamon. One purported use of cassia is to reduce blood sugar levels in patients with type 1 or type 2 diabetes. According to the National Institutes of Health, this claim is unsupported by research. Additional effects cassia is thought to have are to relieve gas, reduce muscle spasms, prevent nausea, reduce pain and prevent infections. Scientific evidence does not support the use of cassia in these applications.